When you have aging laminate counters, you will eventually want them gone. Unlike marble, soapstone, granite, wood, or even to some extent solid surface, laminate does not develop an "attractive patina," as the euphemism goes. Laminate does not age well. It only gets more scratched and chipped. Its top wear layer scuffs away, revealing the image layer—which also begins to scuff away. 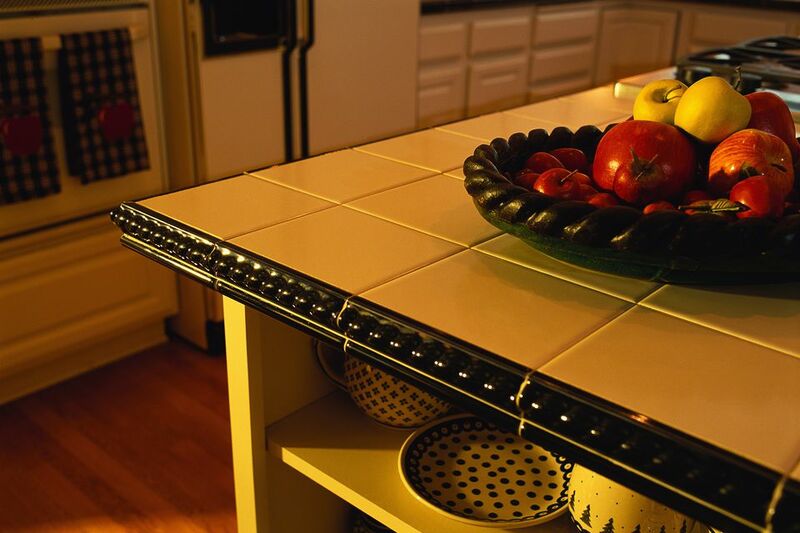 Are there easier and less invasive solutions than full countertop replacement? Something cheaper? Yes. It is called tile over laminate. It is not the best solution. Even the boring but dependable pre-laminated slabs from Home Depot or Lowe's are often better. In fact, if you happen to have wrapped edge laminate (see below), this may be the very deal-breaker that causes you to purchase new counters over the tiling method. But tile does allow for maximum creativity, plus you can carry and easily transport tile in all vehicles (unlike those 73 1/2" by 25 5/8" laminate slabs). Base: Counter laminate often rests on a base of particle board (medium-density fiberboard or MDF) which falls apart over time, especially in contact with water. If you have hollow spots, that means the base is bad. Any installed tile will look fine for awhile, but will eventually crack. Fill these areas with wood putty. Laminate: While the point of installing tile over laminate is to cover up bad laminate, there is a limit as to how bad that laminate can be. If the laminate is de-laminating in areas, the tile will not hold. Use contact cement to reapply the laminate. It does not have to look beautiful; it just has to be firmly stuck to the MDF. Wrapped edge laminate is great stuff. It looks great, and it better resists chipping than square edge laminate. Unfortunately, you cannot tile over wrapped edge laminate. You will need squared, vertical edges in order to accept the tile. By carefully cutting with a circular saw, you can strip away the rolled section. Give the laminate surface a pass with an orbital sander outfitted with 60 grit paper. The aim is not to sand deeply but to give the surface a light sanding that covers it in a field of fine scratches. Sanding is easy; cleaning is hard. Use TSP, rather than cleaning solutions which leave a residue. Tack cloth is another great way to pull up dust. Remember, thinset mortar is for applying tile to the porous backer board. Tile mastic is what you'll want. It has the "grab" that you need for these non-porous surfaces. While it does seem to run contrary to the spirit of tiling right over laminate, it never hurts to put down a cement backer board such as Durock. You don't need to worry about beauty: screw the backer board straight onto the laminate, run strips on the counter edges, and tape up the seams with fiberglass mesh tape. Now you have a fail-proof surface on which to install your tile (and no sanding of the laminate is required! ).